Word has come from Autocar this morning that Maserati is ready to unveil a new smaller Quattroporte-based sedan called the Ghibli. The amusingly named Italian four-door is said to be ready for launch at the Shanghai Auto Show later this year. Looks like Maserati is making a big push for increased market share over the next few years. According to Autocar, the Fiat-owned luxury automaker wants to surpass 50,000 annual vehicle sales. To put that in perspective, Maserati only sold 6,200 units worldwide last year. A nearly tenfold sales jump will require some pretty awesome cars. Maserati hope the Ghibli just might be the vehicle to help bolster sales. The Ghibli is based upon the new Quattroporte steel chassis, which is based upon the Chrysler 300 chassic, which is based upon the Mercedes E-Class chassis from the early 90s. So it’s fair to say the Ghibli isn’t off to the best start. Thankfully, things get better from there. 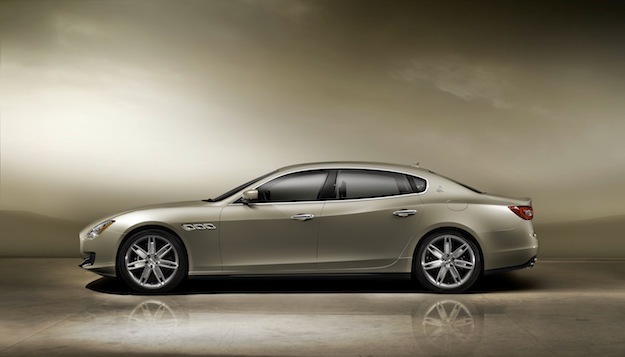 The Ghibli will be 300 mm shorter than the new Quattroporte and on par with the BMW 5 series in overall size. Under the hood, Maserati will offer three engines: a 3.0-liter twin turbocharged V6, a 3.8-liter V8, and yet to be specified diesel engine. We wager it’ll probably be the Fiat-derived diesel found in the new Jeep Grand Cherokee. The V6 will produce 385 horsepower and the V8 will pump out 480 horses. Both engines will be mated to an eight-speed automatic, complete with paddle shifters. No other stats are currently known about the Ghbili, codenamed the M157 by Maserati. But a cheaper, smaller version of the Quattroporte could do quite well, especially in places like Los Angeles where the 5 Series is a bit played out. As soon as more is known or some pictures surface of the Ghibli, we’ll be sure to bring them to you.